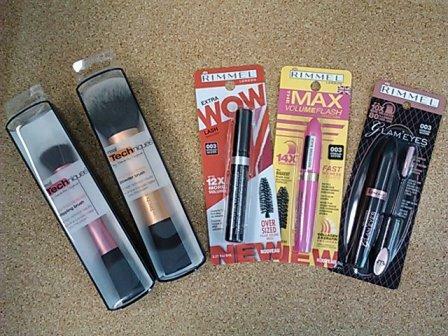 We were in the area of my local Ulta yesterday, so I dropped in really quickly to pick up another realTechniques stippling brush and a new Rimmel Mascara. I was pleasantly surprised to see that both items were on sale, buy one get one half off. So, I ended up with a few extra items that I would have bought soon anyway, and I got them cheaper! Yay! I say, this is my second stippling brush from realTechniques. My first one is just fine, but since I use it both for my BB creams/foundation/tinted moisturizer and my cream or gel blushes, I wanted one for each. These brushes are great. I have a foundation brush, but it is more like a flat paintbrush, and I honestly never got the hang of using it for a light to medium foundation coverage. This stippling brush makes it so easy to put on foundation and make it look perfect... it's kind of amazing, really. I used to be a die-hard fingers or damp facial wedge girl, but now I'm quickly converting to the stipple brush. I've only been using mine for a couple of weeks, but there has been no shedding yet. The lady at Ulta said she's had hers for a year, and has experienced no shedding from her brush. I say, I haven't tried it yet. Out of the box, it is lightweight, but not too lightweight as to feel cheap. The bristles are very, very soft. I have an old Bare Minerals brush that I've used for years now, and it's probably time to retire it. So, this brush is meant to replace it. UPDATE! - I tried out this brush, and it is amazing. It is super-soft, and it picks up powder very well. It distributes easily, and lays down the powder without disturbing my other products. I totally recommend this brush! Extra WOW Lash mascara, the new volume and lash building mascara with a 50% larger brush for WOW volume.The supersized brush makes it easy to build soft to dramatic look with visible progressive volume up to 12X.Lash building formula for highly defined lashes. No clumping. Review to come later! UPDATE - Here is the review! So, there's my Ulta haul. I didn't shop very much, because my family was waiting on me and I just went in to get one tube of mascara and the stippling brush, so my branching out only extended to those similar items that were on sale. Did anyone else go shopping this weekend? What did you get?